i need my haircut. it’s been about a year and a half since i bleached it last and i’ve not really had it cut so much as trimmed for the past several years so now it’s easy to see the difference between the healthy parts and the damaged parts. meh. the pic on the left is a relatively accurate representation of my current style… if mine was blow-dried and flat-ironed, except mine is longer, a little more split-endy, and my bangs (fringe) are (is) almost to my chin. 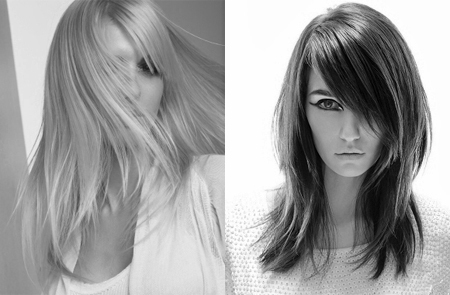 the picture on the right is the cut i’ve been seriously considering. i think it would get rid of most/all of the damaged bits and give it some much-needed volume. also, i like the shape of it and i think it would suit me especially since my hair mostly lays like that anyway PLUS i think it would grow out nicely. i still have a week and a half or so to think about it but i’m leaning pretty hard in this direction… which reminds me – i should probably call shannon and book an appointment. This entry was posted in Uncategorized and tagged hair. Bookmark the permalink. I say go for it. It’ll grow back if you don’t like it. Its still pretty long if you go for the style above, so I say go for it. Shorter good hair looks way better than long bad hair! oooh, love it!!! you should go for it!! !